He talks to surgeons when being operated without anaesthetics, he does not feel pain. 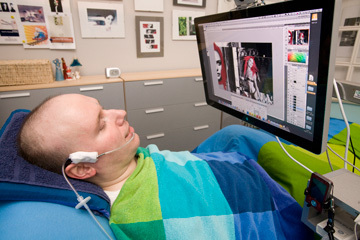 He controls his computer by head movements; he has to blow into the keyboard. A Seemingly trivial accident has turned Adam Simonides into a paralysed artist. On November 9, 1998 then 26-year-old Adam Simonides was taking a ride with his father to work when a stately deer darted onto their car. Adam was badly hurt in the accident. Although there were almost no apparent marks of the injury, after the accident he couldn’t move. He remembers everything; even the details of the talk to his father immediately after the accident. He recalls asking him whether he could get out of the car albeit the fact that he could not make a move. He did not understand what was happening to him. Even in the hospital he thought that it’s only a pinched nerve and everything was going to be all right. It was not! Senior consultant of the Traumatology Department at the Faculty hospital of L. Pasteur Jan Karolyi M.D. had news for Adam’s family that was not easy to tell. "I had to tell them that it was a real tragedy, a very serious injury – cluster fracture of the fifth cervical vertebra with complete interruption of the spinal cord, and that his condition will cause lifetime problems. We could only stabilize the neck and we did so, the most modern way possible. We noted that although the boy does not seem to be injured, he will, yet, remain paralysed. Adam's living space was suddenly narrowed to a hospital ward and bed. His arms and legs were motionless and his breathing was damaged. In fact, the dead nerves caused intercostal muscles stop working. He could not breathe without the ventilation for long. The ventilation breathed for him almost for two months. "When a doctor came to me after the first operation and told me that, although it had been successful, I would never move my legs or arms again, I did not fully realize, then, the situation in which I was. After a few weeks, when I saw that my condition keeps getting worse, the first crisis came. It was accompanied with recurrent pneumonia. I started to lose motivation. Then the doctor came to me and told me: Adam, if you still think like this, you will die within two weeks! You have to recover mentally! I started to train hard and practice breathing. With tremendous efforts and the help of the entire hospital team, I finally learned how to breathe through diaphragm. Doctors and staff were amazing. They allowed me to have unrestricted visitors to the anaesthesiology and the intensive care ward which has got very strict hygiene rules. At Christmas, my parents even prepared the Christmas dinner. There were gifts and all the traditional customs there. One month later I was so well that I could be flown to the National Rehabilitation Centre. My expectations were huge. I thought I would learn there everything. However, after a week or two, I found that they have no longer much to offer. This is my physical condition, which I will live with up to the end." Adam and his computer. He controls it by head movements. The sensor translates the movement to the mouse pointer. Each key must be confirmed by blowing into a special tube. Adam spent in hospitals full nine months after the accident. A small victory came about two years after the accident - his shoulder moved. It was only a few millimetres, but it turned out that he might do even more. He began to train intensively and eventually learned to sit well. For the very first time, he was able to sit for twelve seconds before he lost consciousness. At first it was physically too demanding and uncomfortable. He was losing consciousness in a sitting position regularly, but it improved gradually and now he can sit for several hours. Later, he experienced other health problems and complications. Both femoral heads of his hip joints died and must have been removed surgically. His wounds didn't heal. Then the depression came. Initially, he did not think of them. They were accompanied by nausea rather than the bad mood. However Adam found help of his psychiatrist. "The picture of a red-hair girl was his first. I lay down in hospital for a month. I knew that I would be there for a while, so I took a notebook. I ike graphics. It gives my life some sense." "On the first trip without my parents I was accompanied by my brother. We went to The Rolling Stones concert in Prague. It was a fantastic feeling the concert and everything around. We lived in a specially rebuilt barrier-free hotel. That's when I first realized that I can do something. 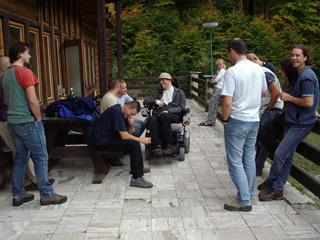 Then I and my friends went for several trips to the mountains, to the water, they were taking me into the town unless my health condition made it possible. Unfortunately, my health has presently deteriorated again, so I spend almost all the time in my hospital bed at home at the computer. However, I can do things that I like. I study a lot, especially web design and related scripting languages, typography, computer graphics. Sometimes I create different images; this takes me a long time though with regards to the way I control my computer." Indeed, it is incredible what a wonderful relationship he has with his friends. They took him virtually everywhere in the world. Where there is no barrier-free access, they carry or pull him upstairs. In the course of nine years, Adam has undergone a total of 15 operations. Eventually he was even diagnosed with cancer. "Cancer? That wasn't the hardest bit. The doctor told me openly that the tumour in an area where I got it can be treated with a high percentage of success. I was ready for the treatment that would be very unpleasant and tiring. It was a bit different in the end. I even gained weight because I felt like eating. And I was surprised how well I coped with it. I felt much worse when I had to put up with the idea that my paralysis won't get better for the rest of my life. Although I know that research makes significant advances and also new discoveries in medicine and in this area are being made, I think that for me it is much too late. For so many years, my body has been very much changed and worn by a number of illnesses and operations. I haven't got two hip joints, a large part of my pelvis is gone, my spine is twisted, joints are deformed ... Well, I know that it may still be at least somewhat better, and it encourages me. I don't ask the following questions: Why me? Why anything like this had to happen to me? Logically, I would not be able to explain that. It would only make my life harder and I would destroy myself mentally. There was a moment that changed my life; I try to take it as it really is. Instead of useless laments upon the question why it has happened, I've been trying to do my best in the circumstances. And I also enjoy what the day brings me. I am basically well, and especially thanks to my parents, family and all my friends I don't miss anything. At least I'm trying to convince myself of that. Confession that makes you shiver, but at the same time it shows how strong a will of a man can be. Adam Simonides's got it. That's why he rather smiles at the world and everything around him. Crying would not help anyone. Photos by Robo Hubač for "Báječná Žena" magazine.